Leominster senior Neil O'Connor does it all for the Blue Devils, but is he the top player in CMass? While a few teams across the region got started two weeks ago, high school football really kicked off in Central Mass this past weekend. Leominster defeated St. John's in the region's most anticipated game, and Hudson turned heads across the state, blasting 5-time defending Super Bowl champion Auburn 33-0, ending a 22-game Rocket winning streak. Doherty and Nashoba held serve, but our preseason power rankings were certainly shaken up by action across Central Mass. Check out our Power Rankings, upcoming Game of the Week, and CMass Player of the Year Watch List below. Not much more you can say about the Blue Devils, who started fast and rode quarterback Neil O'Connor's fantastic decision-making to a fifth consecutive win over St. John's. Things get no easier for Leominster, as they travel to face Eastern Mass power Lowell, a squad ranked No. 9 in the ESPN Boston Top-25. Last Week: Ranked No.3. Defeated North Middlesex 27-19. Doherty also started quickly, but their defense gave slight cause for concern when they allowed North Middlesex to creep back into the game. But, after surrendering 19 straight points, the Highlanders responded with a big drive from senior quarterback Luke Brennan. With seniors Isaac Yiadom and Alfred Adarkwah living up to their preseason billing so far, and the emergence of running back Jahkari Carpenter and receiver Javon Watkins, Doherty looks like it might have the most explosive offense in the region. Last Week: Ranked No. 2. Lost to No. 1 Leominster 32-22. The Pioneers still haven't figured out how to stop Leominster, but make no mistake about it, this defense is improved from a year ago. The offense took a little time to get going, but you get the feeling that St. John's will once again be one of the best offensive teams in the state. It was a rough first week, but a loss to the top team in CMass on the road is nothing to be ashamed of. Last Week: Ranked No. 5. Defeated Westboro 42-21. The Chieftains showed that offense shouldn't be an issue for them, as senior Frankie Chiodo punched in three touchdown runs and quarterback Dan Orlando threw for another three. The rebuilt Nashoba defense is still a question mark, but the Chieftains have rolled off 27 consecutive victories, and didn't exactly look vulnerable against Westboro. Last Week: Unranked. Defeated No. 4 Auburn 33-0. The biggest "wait, is that a typo?" game of the week was Hudson's thrashing of perennial power Auburn. Quarterback Dan Mendes ripped off over 140 yards on the ground to go with three touchdowns, and broke up several Auburn passes from his spot in the secondary. Mendes is just one part of the Hawks' loaded backfield, and pitching a shutout against any Auburn team is a great sign for that defense. Shepherd Hill looks to be it's normal, physical self, while Shrewsbury looks reloaded after losing a ton of talent on offense. Quabbin quarterback Dylan Kierman led his team to a huge win over Holy Name, and St. Peter-Marian physically dominated a tough Wachusett squad. Northbridge seems to have found its quarterback of the future in sophomore Koby Schofer, Leicester held serve and I still can't bring myself to knock the Rockets totally out of it. Too much respect for coach Jeff Cormier and the program he's built at Auburn. While Leominster has a huge game outside of the region against Lowell, the most significant game for CMass purposes is this Mid Wach A battle. The Chieftains looked like their normal dominant selves last week, but this will be their first true test of the season. The Nashoba defense may be vulnerable, breaking in new starters all over the place, but will a largely new-look Shrewsbury offense be able to capitalize? Senior running back Nick Diliberto looked great in his first start against Algonquin, rushing for 126 yards and a touchdown against the Tomahawks, but the Chieftain front will present a bigger challenge. Basically, these are two teams with plenty of questions to answer, but a ton of talent as well. We will know a lot more about both of them after this weekend. 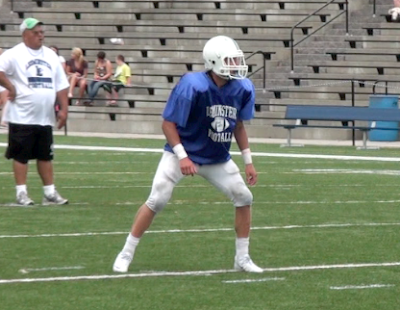 O'Connor was Leominster's top receiver in 2012, but he has the look of a star quarterback in 2013. His first start was a huge win over rival St. John's, throwing and rushing for a combined 266 yards and four touchdowns, including the game winning TD run. One game has shot the versatile senior from intriguing preseason position change, to one of the most feared weapons in Central Mass. Yiadom had a great 2012 on both sides of the ball, and he started 2013 well, catching two passes of over 30 yards last week against North Middlesex, and helping the Highlander defense tighten up near the end. The Boston College commit is probably the most dangerous player in the region with the ball in his hands but, with the emergence of other play makers at Doherty, will he get enough touches to put up eye-popping numbers? Smiley entered the year as one of ESPN Boston's preseason All State quarterbacks, and the Pioneer dual-threat signal caller showed why against Leominster, throwing for two touchdowns and adding another on the ground. He leads the most up-tempo attack in Central Mass, but the Pioneers will need to do some winning for him to be considered the region's best. Kierman picked up where he left off last season, throwing for just under 300 yards and three touchdowns in Quabbin's upset of Holy Name. Last season, Kierman finished behind only Smiley in CMass passing yards, but the Panthers finished below .500. Another year of big numbers and a winning season could put Kierman on the map as one of the better passers in the state. Brennan is often overlooked because he has so many weapons, but he was a huge part of Doherty's breakthrough season last year. This year, he may have the best collection of skill talent in the region, and he's shown he has the arm, and the legs, to lead the Highlanders into the postseason. In the Hunt: Jarell Addo, Sr. TE/S, Leominster. Mark Wright, Jr. RB, Auburn. Dan Mendes, Sr. QB/DB, Hudson. Koby Schofer, So. QB, Northbridge. Davon Jones, Jr. WR/S, St. John's. Nic Wojnar, Sr. QB/LB, BVT. Ben Reiffarth, Jr. RB, BVT. Addo may be the region's best college prospect (Competing with Yiadom), and his teammate O'Connor may be the only thing keeping him from high school accolades. Nobody in Central Mass does more for their team than those two. Wright and the Rockets came back to Earth in week two, but his opening weekend performance has the junior running back on everybody's radar. Mendes powered the Hawks past Auburn, rushing for three touchdowns, not to mention all that he did on defense. Schofer appears to be the answer at quarterback for a Northbridge team looking to replace star QB Matt Phelan. Davon Jones does a little bit of everything for St. John's, and he grabbed a long touchdown in the Pioneers' losing effort, while Wojnar and Reffarth should power the imposing BVT ground game all year.